It’s been a tough year for Wayne Rooney. Not only has the Manchester United forward struggled on the pitch with only one Premier League goal and a boatload of injuries, but the once beloved Englishman also has received an incredible media backlash due to his alleged role in an extramarital affair with an internet prostitute while his wife was pregnant. So Rooney has been forced to move in exile to Portland, Oregon as he heals from injury and trains in a state-of-the-art facility designed by Nike. But just because he has departed across the pond doesn’t mean he’s off the hook yet. 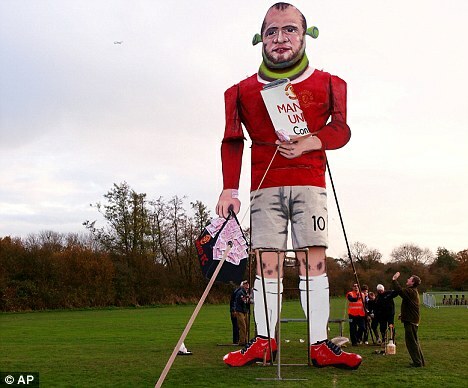 In fact Rooney’s likeness is being crucified by Englishmen all over the country due to his negative role in a Manchester United record contract extension that originally left fans thinking the forward was definitely leaving. But the U-turn signing hasn’t left all fans ecstatic to have the troubled forward back for good. Just ask the town of Edenbridge which recently hosted a bonfire ceremony in which the crowd burned an effigy of the unpopular Red Devil. Rooney’s likeness was enhanced by Shrek ears attached to his face and a 200k a week wage contract in hand along with a giant bag full of money. The crowd torched the 30 foot effigy and watched it burn in a traditional ceremony performed each year by the town to celebrate the failed Nov. 5 plot to blow up parliament and King James I in 1605. Each year the town chooses a different villain to dishonor as publicity for the bonfire and firework celebration. In the past Saddam Hussein has been the effigy holding a machine gun and missile in hand. Tony Blair also was dishonored one year with the selection, but this year it was the greedy footballer that would receive the bonfire treatment. He gives us very, very, very good publicity. He has brought it on himself. He has decided that he doesn’t want to toe the line. One of the main things was his greediness. And no wonder Rooney has left England because if they are erecting 30 foot monuments for the sole purpose of setting them ablaze then perhaps Portland, Oregon is the best place for the troubled striker to be at the moment. After all we Americans may be sports-crazed as well, but I’ve never heard of any town in America burning a 30 foot high effigy of a professional athlete. Labron had some shirts burned with the Decision and Lane Kiffen upset some folks in Tennessee when he left after one year, but nobody has ever created a 30 foot high voodoo doll and turned it to ashes here in the U.S. to my knowledge.